Snom technology AG develops and manufacturers Voice-over-IP (VoIP) telephones based on open standard for enterprise communications. 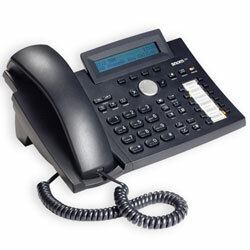 The Snom 320 Innovative Business SIP Based VoIP Telephone fulfils the most important requirements of VoIP telephony and additionally offers numerous functions that are indispensable in the business world. Dimensions: 9.8" x 7.9" x 4.7"